For information on how to implement edge detection successfully with your C# camera application using the Ozeki Camera SDK please look at this guide. To succeed, OZEKI Camera SDK has to be installed and a reference to OzekiSDK.dll has to be added to your Visual Studio project. Edge detection is one of the main parts of image analysis, image and computer vision technology. Edge detection can be used to capture changes in a wide scale. With the help of edge detection you can capture discountinuities on surfaces, changes and variations which can be extremely helpful in the branch of construction or even in face recognition. 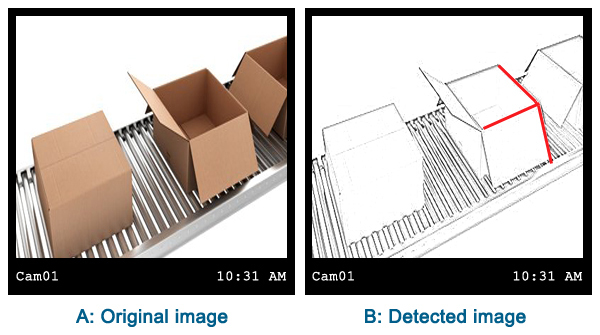 Since discountinuities can be easily captured with the edge detection function, it is possible to use it for checking different devices for defects or even food pack checks. For detecting edges we can use the IEdgeDetector object of the Ozeki Camera SDK. After an instance has been created with the help of the static ImageProcesserFactory class we can detect on frames and on video as well. No actions are executed on the input frames they are simply forwarded by default. However, the object which implement the IImageProcesser interface (for example the IEdgeDetector) can be added with the help of the AddProcesser() method. More instance can be added which implement IImageProcesser, they will run one after the other using the image which is before them in the list. The initialization of the global variables is the task of the Init() method. The instance of the FrameCapture mediahandler are set here and the IEdgeDetector instance is also created here with the help of the ImageProcesserFactory. This also can be added to the ImageProcesserHandlerinstance. This method fills the TextBox-es which can be found on the GUI with the actual settings of the IEdgeDetector instance using the InvokeGUIThread() helper method. Colorized: if the value is "false" the detected edges will appear in white on a black background. If the value is "true" the detected edges will have the color of the object. After learning the examples and information of this webpage you will be fully familiar with the field of edge detection. You will gain knowledge on how to implement edge detection with your C# camera application using the Ozeki Camera SDK.